During operation, exposed industrial machines pose hazards to workers and their surroundings – potentially resulting in damaged property or serious injury to employees. Powerful shop presses have more than enough strength to shatter even the most durable materials, sending debris outward at high velocities. Broken metal fragments and projectiles aside, Oregon OSHA reports that workers caught in, on, or under equipment and machinery results in more than 700 fatalities and more than 200,000 lost workday injuries nationally per year. To protect workers, there are a variety of machine guards available on the market today. Commonly made from plastic, metal, or wood, industrial and manufacturing environments typically utilize metal guards due to their durability and low-maintenance. Metal machine guards not only provide a physical boundary and barrier for workers, but simultaneously protect them from material ejections during operation. Industrial workplace accidents can arise from a variety of incidents: the unintentional start-up of a machine, adjustment of materials during operation, slips and falls, or debris ejections. The absence of a guard increases the risk of injury, as clothing, hair, or limbs can get caught in moving parts or nip points. Even when workers distance themselves from an active machine, seemingly ample space may still fall within the danger zone of shrapnel or debris. Leaders at H.O. Penn Machinery Company recognize the vital importance of machine and shop press protection at each one of their locations. H.O. Penn Machinery is the exclusive Caterpillar® heavy equipment dealer for the lower 13 counties of New York and the entire state of Connecticut – offering service, repairs, and new and used equipment sales. To protect personnel from debris from the company’s shop press, H.O. Penn chose an Industrial Safety and Security System by American manufacturer, Cascade Safety & Security (a division of Cascade Coil) featuring GuardianCoil® coiled wire fabric. The fabric is unlike any other – constructed by interlocking metal wires to create highly durable mesh panels. Cascade industrial safety systems are visually unobtrusive and allow views and light into the area of operation. Equipped with easily operable safety hooks, the systems provide machine operators quick and simple access to equipment during downtime that easily slide back into position for reliable protection. Cascade systems are a cost-effective alternative to traditional safety guards, while achieving the full range of protective functions necessary for industrial environments. As featured on the H.O. Penn press guards, GuardianCoil is typically secured at the top and hangs free at both sides and the bottom. This allows the durable coiled wire fabric to wrap around a projectile upon contact and drop it to the floor. GuardianCoil’s flexibility prevents the object from leaving the work area or ricocheting back toward the operator or their surroundings. 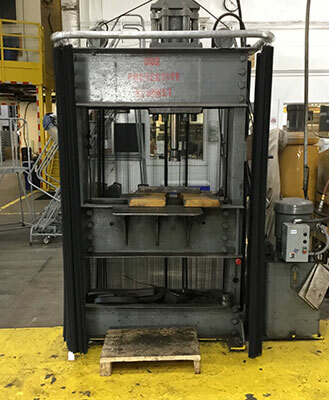 “We purchased a customized press guard with adjustable curtain assembly to protect our employees from flying projectiles or broken objects under pressure in our 150-ton shop press,” says Markus Wesaw, Corporate EHS Manager at H.O. Penn Machinery in Poughkeepsie, NY. The press guard features ¼”-16 gauge high-strength stainless steel GuardianCoil, in Safety Black color, secured with a custom-engineered pipe suspension assembly. Safety Black is popular for industrial settings because the dark color won’t reflect light, providing improved visibility through the mesh. For the H.O. Penn press guard, the two separate panels are sized at 60” x 78” and 66” x 78”. If the item being manipulated chips or breaks while the shop press is in operation, the guard will catch the debris. To penetrate GuardianCoil, objects with a diameter larger than the weave size must first flatten the wire in all directions at the point of impact. In doing so, it loses a significant amount of energy, therefore reducing the risk of injury. GuardianCoil machine safety guards and range of other customizable industrial systems are compliant with OSHA’s requirements of preventing injuries from projectiles. The OSHA standards outline that “any machine part, function, or process which may cause injury must be safeguarded.” GuardianCoil systems exceed the standards, providing comprehensive coverage for machines and industrial equipment of any size. GuardianCoil systems are ideal for ejection and blast curtains, pinch point barriers, machine guards, hydraulic press guards, and security enclosures and gates. The material possesses superior strength and corrosion resistance for environments exposed to water or moisture. GuardianCoil is fireproof and does not absorb oil or other flammable liquids. The fabric is low-maintenance and tends to shed dust – a good quality to have for industrial settings, which by nature will expose the material to dirt and debris. GuardianCoil impressed the H.O. Penn team so much that Wesaw will be ordering similar shop press guarding systems for all of his branches in the near future.